On this site you'll find all the best inner thigh exercises. 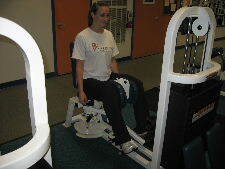 This page has pictures and instructions for a seated inner thigh exercise machine. Before I show you the pictures, I must emphasize that working your inner thigh does not magically get rid of fat from the inner thighs. Working the inner thigh muscles helps to strengthen the muscles, tone the muscles, and can build up the muscles. If you have a significant layer of fat over your muscles, you should take a comprehensive approach to weight loss. In order to lose fat on the inner thigh, you need to eat a healthy diet, do cardio, and lift weights for your legs. Also, note that sitting on machines does not improve balance or core stability. I personally would first recommend doing standing cable hip adductions, side lunges, and plie squats for the inner thigh. The above 3 exercises are great inner thigh exercises. They all work additional muscles and challenge core stability and balance. It is okay to use an inner thigh machine from time to time in your workouts, but I would recommend using other exercises also. Below is a picture of a common inner thigh machine. This is a simple exercise to perform. Starting Position: Sit comfortably in the machine and adjust the pads so that you get a good stretch in the starting position. Form: Exhale and squeeze your legs together until the pads touch. Hold the pads together for a brief second and then slowly return to the starting position. Personal Trainer Tips: Move only as far as you feel comfortable at the starting position. If you have pain in the hips, or pelvis during this exercise, decrease the weight, move a little slower, or take it our of your leg workout routine. Remember that spot reduction is common exercise myth. Working your inner thigh will not magically get rid of fat on your thighs. And remember that sitting on machines don't really challenge your core stability and balance. Learn more of the best inner thigh exercises.